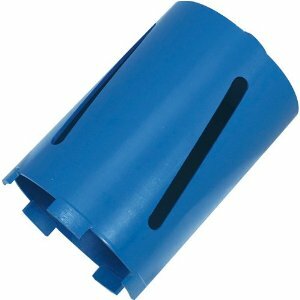 Diamond dry cut core bits cut clean holes with no breakout and are suitable for brick and concrete blocks etc. They are ideal for plumbing, electrical, engineering installation and general building tasks. All cores are 1/2 inch and BSP threaded. Diamond cores must always be used with power drills rated at 850 to 1,000 watts that are equipped with a safety clutch and variable speed function. Speeds of between 440 and 2,500/min are required for the correct application of core drills. NOTE: HAMMER OR IMPACT DRILLING ACTION MUST NEVER BE USED WITH DIAMOND CORE BITS AS DAMAGE MAY RESULT TO THE CUTTING TEETH.